Young boys operate telephone switchboards, 1876-77. Young boys operate telephone switchboards, 1876-77. After Alexander Graham Bell patented the telephone in 1876, his company would then hire teenage boys for cheap to work the switchboards and connect callers. Bell, however, found that the boys were rude, they would prank callers and curse. © 1995-2017 The Telecommunications History Group, Inc. All Rights Reserved. 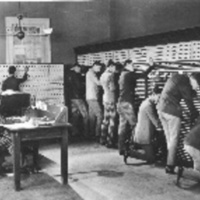 The Telecommunications History Group, “Young boys operate telephone switchboards, 1876-77.,” Théâtrophonics, accessed April 19, 2019, http://theatrophonics.org/items/show/78.